Morecambe boss Jim Bentley praised his side for their determination as they fought back from a 1-0 half-time deficit to draw 1-1 with the Cobblers - but felt they could have claimed all three points. Town led at the break thanks to Timi Elsnik's 22nd-minute strike, the midfielder having an instant impact at his new club having signed on loan from Derby County on Friday lunchtime. But Morecambe were level within seven minutes of he restart thanks to Richie Bennett's close range finish, and the Shrimps then had the better of the chances in a scrappy game at the PTS Academy Stadium. Unfortunately for them, they didn't take them, but Bentley was still proud of his team's performance, with the point gained taking them two points clear of the drop zone thanks to Macclesfield's 3-2 defeat at Cheltenham Town. 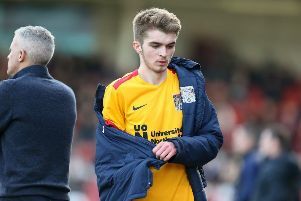 "Northampton were better than us in the first half, but It was a fantastic goal for us at the start of the second half, and then arguably we could have gone on and won it," said the Morecambe boss. "We have had a goal disallowed and we have worked the keeper as well. "Northampton have had a couple of efforts at the other end, so overall it is a fair result, but when you come on that strong in the second half you are hoping you can just go and nick the win we so badly need at the minute. "There were plenty of positives there though, we showed character to come back. "When all is said and done, we are where we are in the league and we have come away from home for an early kick off, have gone 1-0 down, but then shown determination to hit back. "Since Curley has gone in, Northampton have certainly picked up, and they are a big club with good players. "You have the likes of Andy Williams coming off the bench who is their top scorer, and I am standing there thinking 'they are not bad, these'. But looking at ourselves, we have done okay. "We maybe could have nicked it at the end, but we will take the point because we needed to get back on track after the way we lost the previous game. "But we do need a win sooner rather than later, because draws won't be enough for us."